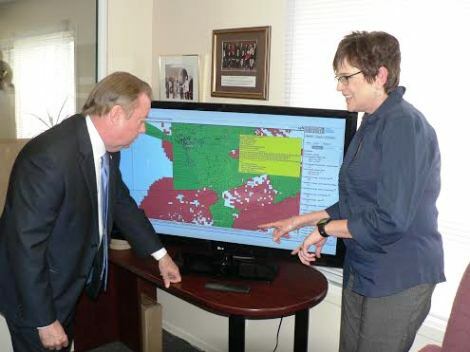 MP Jay Aspin listens as Blue Sky Net Executive Director Susan Church explains gaps in high speed internet across the district. If you're not happy with the speed of your internet, you'll be happy with an announcement today by the Federal government. MP Jay Aspin announced that $1.3 million will go to a group called Blue Sky Net to assess the need for high speed internet across the North. Having high speed internet attracts businesses to areas that wouldn't be given a chance without it. When businesses expand or re-locate here, that creates jobs and lowers taxes for residents. For example, Magnetewan is still on dial up, and places like Peninsula Road and Feronia need upgrading. Church says Blue Sky Net, a not-for-profit corporation, works to remove barriers to cellular and broadband for businesses, develops web sites and helps e-commerce. BSN has helped almost 200 clients, from small one person companies to large mining companies, and has been in operation for 12 years.